Governments across the globe are collectively spending trillions on security and emergency services. Everywhere you look there seems to be more high tech military operations, more fires and more police and emergency services operations. The rise in emergencies and military operations requires better, constantly evolving technology, including unmanned aircraft systems (drones) and armour to handle these situations. 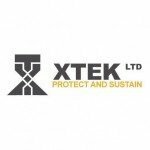 XTEK (ASX:XTE) is leading the way in the manufacture and supply of cutting edge technologies that meet these needs. XTE has superior patented technology and is already supplying products, including drones and personal protective equipment to government agencies and military bodies. An Australian soldier with a drone supplied by XTEK. In fact, should it win a prospective government contract, it will have a multi-million dollar opportunity to satisfy – which is big deal for such a small company. Meanwhile XTE has acquired Simmersion Holdings, a 3D software and services company that potentially strengthens XTE’s UAS systems and improves even further on its already rapidly evolving mapping capabilities. 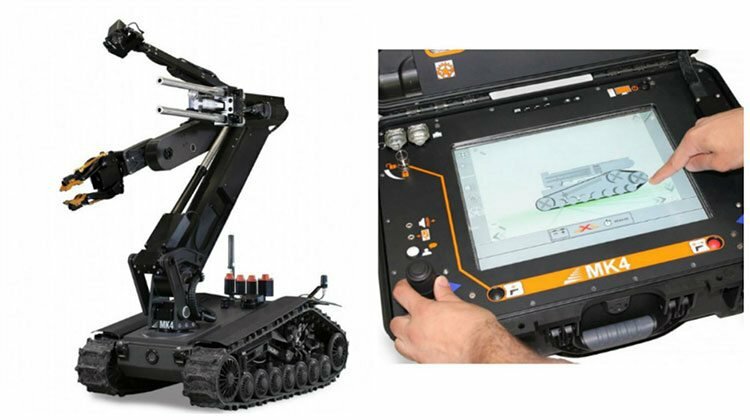 It has been a big month for XTE who, on top of the acquisition, also received an operationally advanced bomb disposal robot from its Canadian manufacturer for delivery to a leading Australian law enforcement agency. This is the first delivery of the ICOR robot range in Australia and highlights XTE’s ability to source and supply the very best technical solutions for its clients from across the globe. Then there’s the recent capital raising. XTE drew down $250,000 from its three-year $10M equity facility with Kentgrove Capital, to keep it well funded. The funds will go towards expanding the business and commercialising innovations including the Unmanned Aircraft System business. Going by the above information, the large markets, and the government agencies this company sells to, you’d be forgiven for thinking XTE was a big company. However it is currently worth just $8MN. With potentially big contracts on the horizon, a view to go more commercial, and some advanced proprietary technology, we could see this undervalued company re-rated before too long. 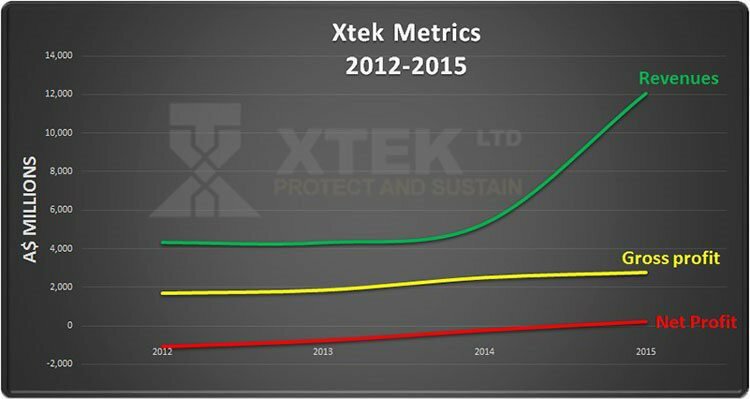 XTEK Ltd (ASX:XTE) secured over $12MN worth of sales last year for their defence and emergency services equipment. That’s a pretty good number considering the size of the company. Sales have primarily come from their drone and homeland security products and it is these solutions as well as associated technology that really looks to be gaining momentum in military and emergency services circles. We first covered XTE in our article, Game of Drones: ASX Stock Set for Aerial Uplift? published last month. We had a detailed look at XTE at that time, and now we’re back to update our readers on the company’s progress, and how 2016 may pan out. XTE has a strong range of products and on top of generating over $12MN in revenue last year, it also has government contracts coming in which means that revenues could grow even higher from FY17. XTE manufactures and brokers the sale of dozens of gadgets and gizmos that are used by military service and law enforcement personnel around the globe. Not only that, but its new wave of tech products will provide better equipment for soldiers, including stronger, yet more lightweight body armour and quite possibly the biggest factor, smart drones for military reconnaissance. Unmanned aircraft systems (UAS), otherwise known as drones, are already revolutionising several industries that are screaming out for better aerial imagery and mapping. The defence industry is no different. 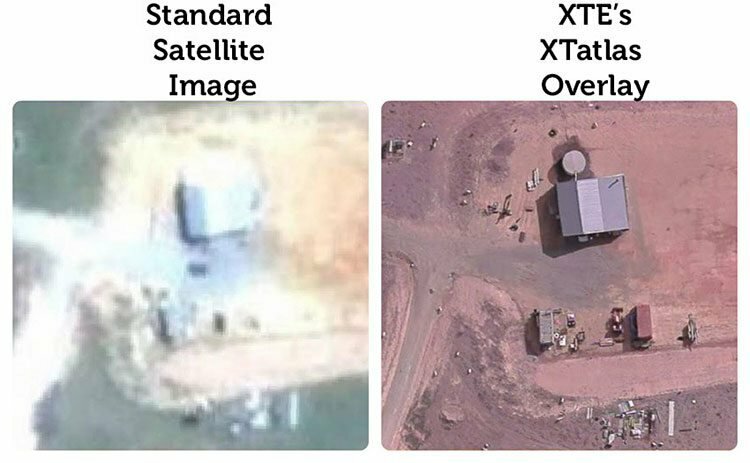 XTE’s technology is currently being looked at by a wide range of commercial and government agencies, including the US Defence department – who spend over $600BN per year on military operations. We expect to hear more on this front in the coming months. 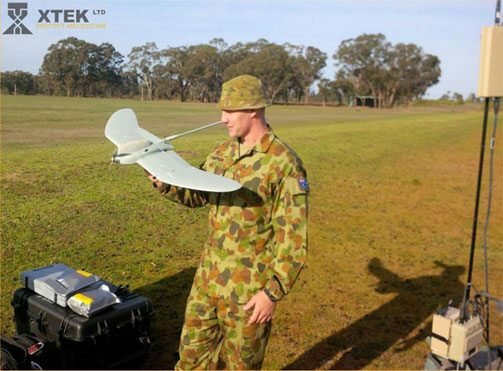 Closer to home, XTE is currently a supplier to the Australian Defence Force (ADF), having sold and delivered around $7MN worth of UAS equipment to the Australian Army earlier this year. And it’s great timing with the UAS market forecast to grow from US$6.76BN in 2014 to US$10.57BN by 2020. That’s a growth rate of 56% over 6 years. As we mentioned earlier, the world is not getting safer. Government agencies are spending tooth and nail to acquire the best possible gear to make the jobs of their police and militaries easier. XTE is selling not only into the drone market, but also into personal equipment, homeland security and ancillary markets. XTE isn’t a plain Jane drone seller. That’s just one of the strings in their bow. Let’s take a look at how XTE goes over and above drones and how its unique composite moulding technology could take body armour into another dimension of strength and agility. Remember, XTE is already generating revenue from its comprehensive range of military equipment and products with revenue doubling in the previous financial year. Two XTEK developed UAS – a short range multi-rotor and long range, long endurance fixed wing small UAS. XTatlas Mosaic Live capability – spatially accurate mapping. So not only does XTE provide a range of drones for sale, it also supplies software and other accessories that actually make them useful. And just last month, XTE acquired Simmersion Holdings – a company specialising in 3D modelling focused on urban planning. Which should make the technology even better. Simmersion has generated an extensive 3D data set for its Simurban software covering parts of most capital cities in Australia. 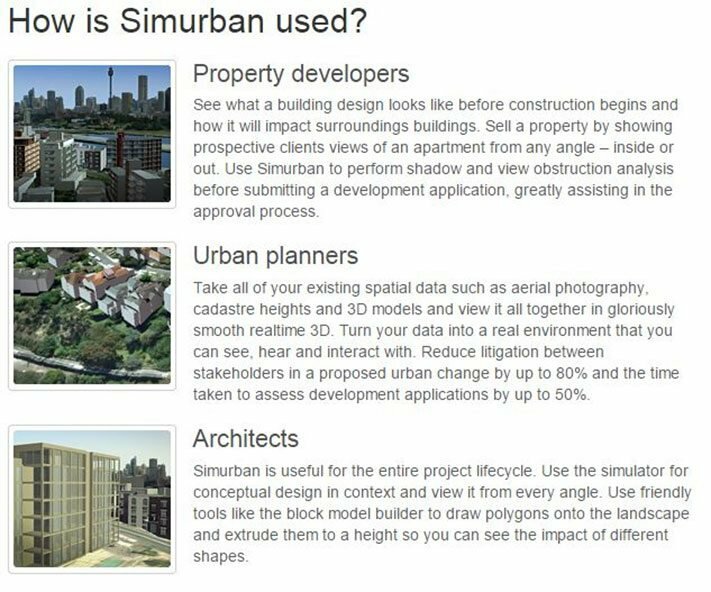 The data is currently used by local governments and property developers to visualise urban planning scenarios as part of the property development application process. The tie-up between XTE and Simmersion means XTE can further develop its technology with urban applications. In fact, the link between Simmersion’s tech and XTEK’s drones opens up whole new markets beyond emergency responders and army personnel. 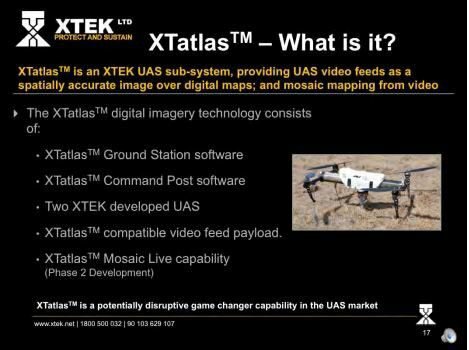 This was one of those acquisitions where synergies can be quite formidable, and it makes the XTatlas product all the more attractive as companies look to deploy drones in urban areas for delivery and reconnaissance, and who knows what else. Examples here could include Amazon (for delivering your shopping), property developers and architects. 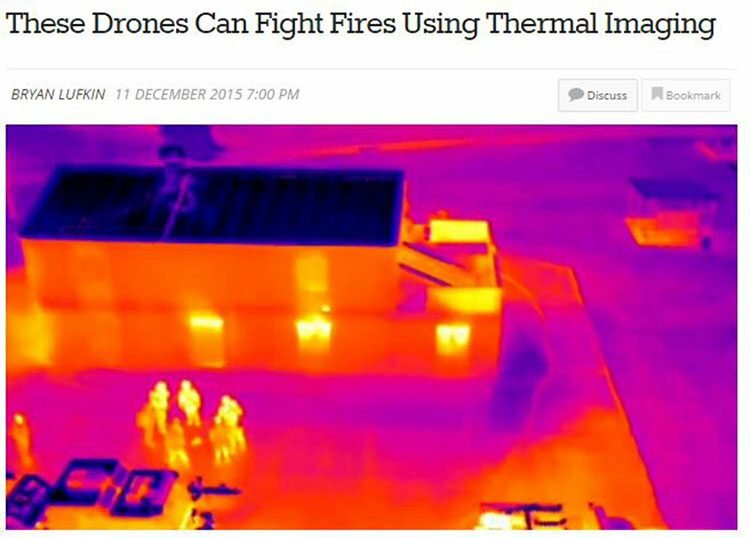 Think about how useful 3D building data could be for firefighters using UASs in extreme fire situations given their aerial supremacy and low relative cost. If we spread our horizons just a bit more, there are literally dozens of things drones are capable of, with applications not yet devised. 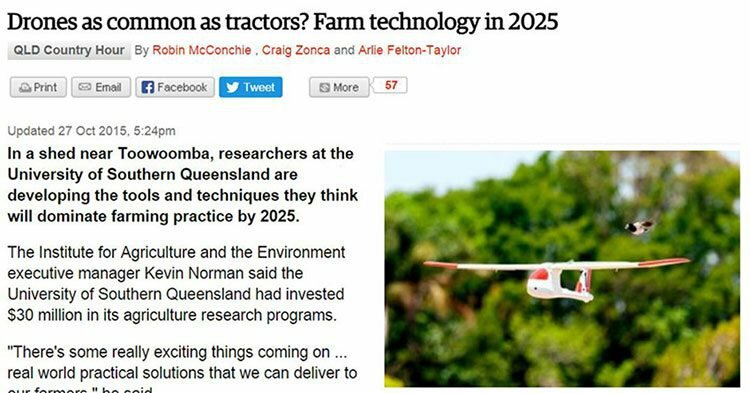 Drones could become as common as tractors over the next 10 years as R&D catches up to what farmers are actually looking for. For the time being, it’s early days although a $1.1BN government-backed grant towards technology in agribusiness, shows that these days, it’s truly an exciting time to be a farmer . ...which is what drones provide. While XTEK’s primary business is currently with emergency services and military, the company is looking to broaden its horizons and become a leading tech innovator in drone product development for commercial markets. The following illustration gives you a clear indication of where this tech can be best used. And what it can be used for. With a sharp focus on commercialising the XTatlas technology over the coming years, and with drone technology rapidly evolving in new markets, there is no reason why XTE can’t become a leader in supplying drone technology to the masses. In addition to its cutting-edge UAS intellectual property, XTE is also serving up patented IP in body armour production. 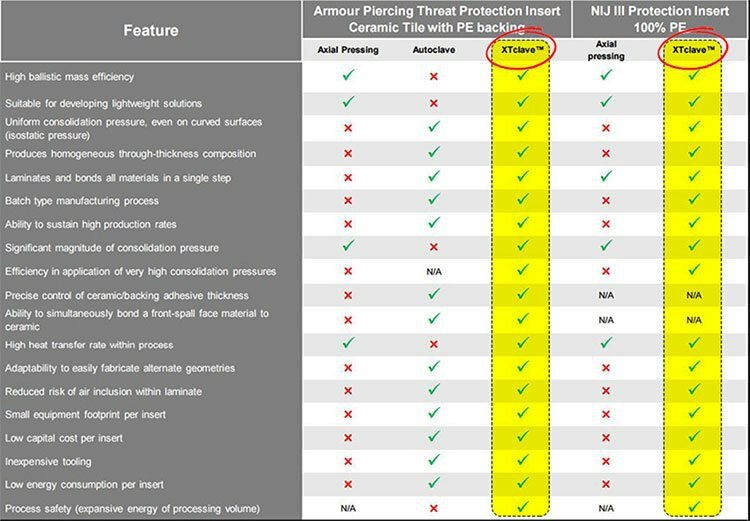 XTE’s unique liquid-processing technique for body armour manufacture is rather more effective than traditional gas pressure variants, which gives XTE an edge. Let’s take soldiers and police as an example. Imagine your protective services officers in equipment that is easy to wear, and is easy to move in because of its light weight, but at the same time, that equipment also has improved personal protection? That’s a win for them and a win for John and Jane Citizen as those that serve and protect can themselves feel safer doing their duty. Now let’s have a look at the market for this armour. The US currently accounts for 50% of the globe’s total body armour sales totalling around $US7BN. XTE’s personal protection hard-amour niche could potentially be worth around US2.2BN between 2017-2022. The XTclave manufacturing process uses liquid pressure to form objects in composite materials which is rather more effective and precise than air pressure. The improved manufacturing process allows XTE to produce a variety of shapes therefore expanding the range of applications its products have from standard body armour to weapon components and aerospace parts. In effect, this means XTE’s hard armour niche is likely to expand into other applications and expand the company’s addressable market with it. 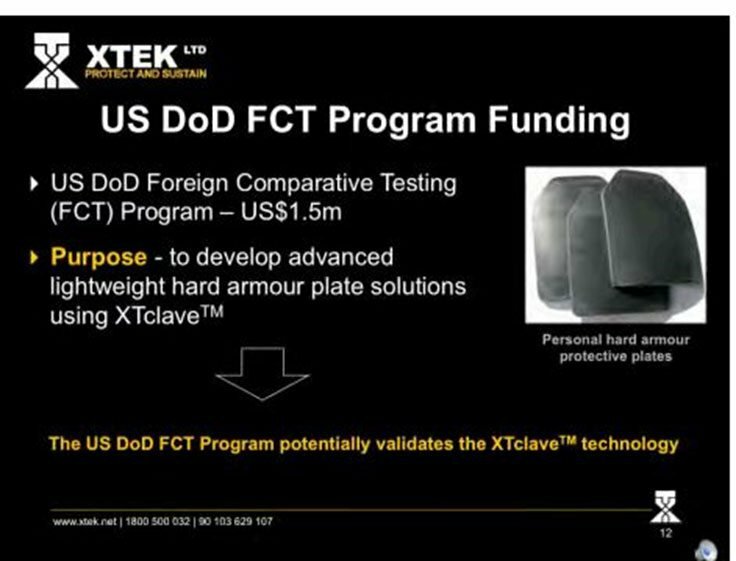 XTclave technology is currently being tested by the US Department of Defence (DoD) with findings due to be delivered to DoD technical staff over the coming months. In 2013 XTE signed a US$1.5MN agreement with the US DoD , and were given a two year window within which to show XTclave’s potential. The program will conclude over the coming months with final reports scheduled to be delivered to the US DoD outlining XTclave’s capabilities. 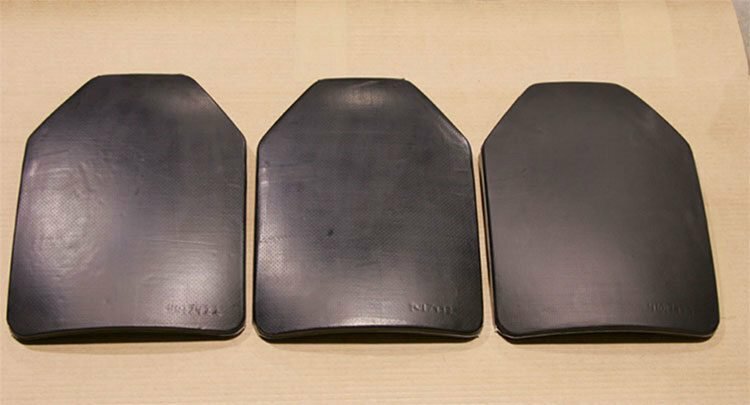 Should those reports be positive, this could provide XTE with an enormous uplift and position the company to become a key player in the supply of hard armour personal ballistic protection plates to US defence, police and security agencies. However at the same time, XTE should still be treated as a speculative stock and investors should do their own research if considering for their portfolio. Here is what the DoD want – and what XTE aim to supply. XTE has already entered the US DoD’s Foreign Comparative Testing (FCT) Program, in a deal worth US$1.5M. In the coming months, XTE expect to find out the results of this testing. Positive news arising from this could be described as a potential catalyst that could re-rate XTE in the near future, as it would act to validate XTE’s technology in the US market. If the DoD doffs its cap, XTE could potentially have a multi-million dollar opportunity to satisfy within the US market – and yet the company is worth less than $10MN at today’s prices. At the same time, there is no guarantee XTE will be able to pull off a big contract with XTclave – it’s early days in the commercialisation of this tech – so professional advice is advised if considering investing in XTE. We’ve written a great deal about military and emergency services, but what of the broader market? 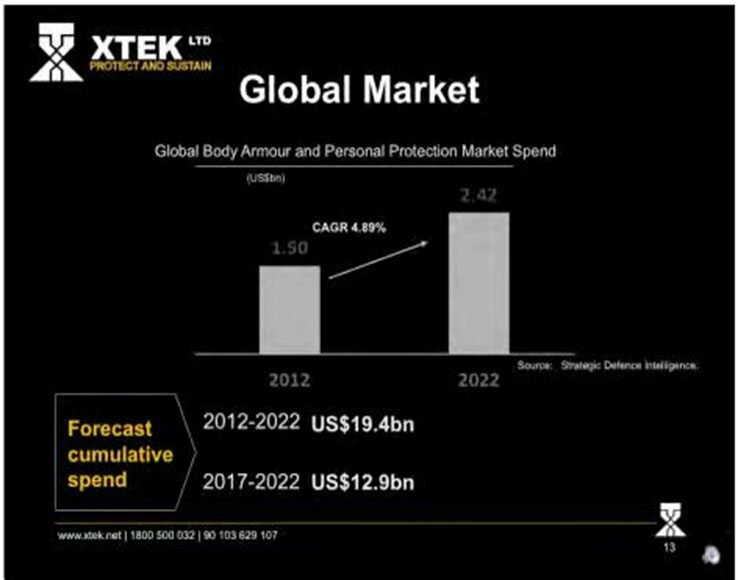 The global market for body armour and personal protection equipment is estimated to grow from $US1.5BN in 2012 to US$2.42BN by 2022 and the forecast spend from 2017 to 20222 is $US12.9BN. Here are the numbers as a visual aid. And here is the market opportunity. 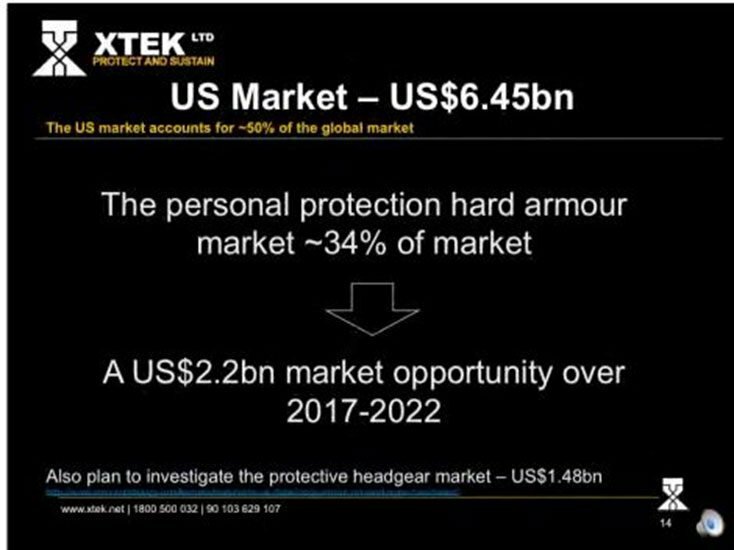 When looking at the body armour industry in isolation, it’s already a large market with excellent commercial potential – assuming you have the technology to break into it. In 2016, the company will look to joint venture and strike up licensing partnerships with US manufacturers, with a view to establishing a potential US XTclave manufacturing capability. As we mentioned earlier, XTE’s liquid-processing technique gives XTE the capability to produce lighter and stiffer composite products not only for human body armour, but also, for other machinery and equipment. One such potential application is bomb disposal robots. The sad reality is that bomb disposal is becoming an increasing concern for both armies serving abroad and domestic bomb disposal teams on edge about potential acts of terrorism. XTE is serving this market niche also through technology developed by a Canadian manufacturer. XTE announced the recent sale of the ICOR Caliber MK4 EOD robot to an Australian law enforcement agency. Here’s a pic of the robot. This type of robot could be adopted en-masse by border control agencies, police forces and military units fighting with daily cases of improvised explosive devices in battle theatres such as Iraq and Afghanistan. The fact is, it could be used in any volatile situation around the world, including locally. And XTE has been the first company to sell the ICOR robot in Australia – demonstrating its position in the market and connections to Australian law enforcement agencies. Any small ASX-listed upstart is likely to face funding issues at some stage in its history. XTE is no different, although in XTE’s case, there’s a $10MN capital line from Kentgrove Capital available if needed. Just last month XTE tapped Kentgrove for $250,000 . 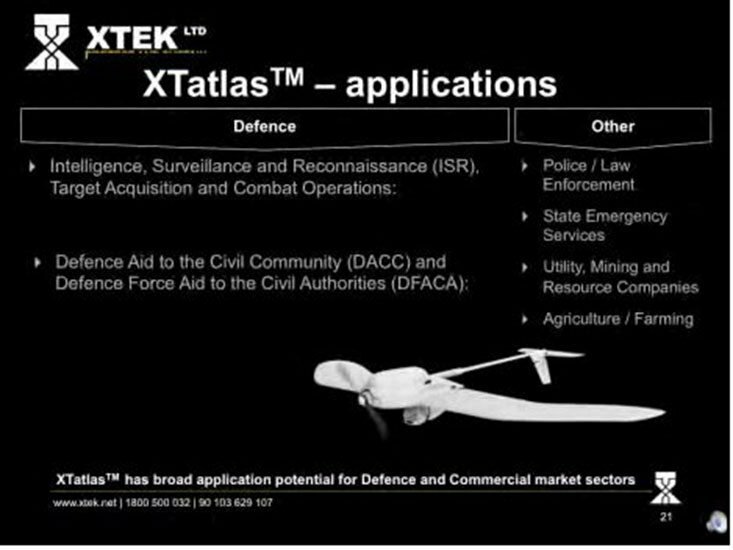 Further funding may be required to further commercialise XTclave and developing UAS solutions, including XTatlas. With no debt on its books, continuing government sales and organic growth potential, XTE is well protected and well set to potentially become a significant defence contractor, backed by institutional funding. XTE’s close quarters work with both the US DoD and the Australian DoD, indicates that despite its small size, the company is still a significant innovator in its industry. XTE is a small company with a great deal of fight in it. Having been around since 1975 and now commercialising its proprietary technology, this could be the time when XTE’s long years of hard work finally pay off. With XTE we think we have found another strong addition to our portfolio because the company has bundles of proprietary technology, is already doing business with defence departments in both the US and Australia, but remains capped at $8.26MN. XTE is focusing on developing cutting-edge technology for security purposes and more commercial outlets as well. Considering that wars, internal conflicts and general emergencies are becoming increasingly reliant on automated machinery in order to preserve human lives, XTE’s product line up fits into that trend rather well. Its flagship products are body armour technology to protect soldiers and UAS hardware/software for reconnaissance. Therefore, companies focusing on building and supplying the most robust solutions to reduce their reliance on man power in emergency situations are likely to have the best chance of long term success. And XTE is waiting in the wings to supply that solution.